Sleepwalking Stories...: Movie Review: Delhi Belly: Romping Ribaldry Works! Movie Review: Delhi Belly: Romping Ribaldry Works! Do words come out more spontaneously, when one were to write about a movie one enjoys? Probably - YES, for all ‘good movies’ appeals to our certain senses, likes and perceptions that we have developed over the years? 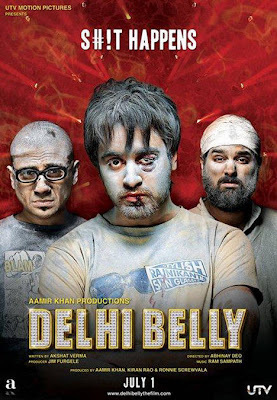 If you draw an outline, Delhi Belly’s story has been told in many unimaginative, repetitive ways before in Hindi and regional cinema. A portly man from Russia alights at Delhi Airport and hands over a package meant to be smuggled through an air-hostess Sonia (Shenaz Tresurywala), who is unaware of its contents. She passes on the delivery responsibilities to her fiancee Tashi (Imran Khan), a bored newspaper reporter, who passes it on to his obese photographer room mate (Kunaal Roy Kapur). The photographer, devastated with painful bowel movement, passes the package to his caricature making room mate (Vir Das), who gets the destinations mixed up. Then come the goons, missing diamonds, retrieval and chase, the police, a ‘lesbian’ sequence, and finally an old scooter crashing down. It is the stench-funny contents within this framework that the film is endearingly disgusting. This brilliantly held-together trashy tale (Writer Credit- Akshay Verma) of swear words, ribaldry and mistaken identities, fires all cylinders in its 96-minute telling of a story that is the most daring in its dirt content. There are orgasmic moments - fake and real, cracked ceilings, bosom-honks, human excrement (with exclusive booming sound design) and a lovelorn, gun-wielding lover. The swear words are just not there as props, nor are the toilet jokes, all wound deep in the story-characters cobweb, giving it reason to be shouted out loud and clear. With hardly a plot thread out of place in this deftly built jigsaw puzzle, it is the open yet controlled black, black humour that gets us through. Aamir Khan Productions took a risk and it paid off. Director Abhinay Deo’s second release, post the Game debacle, proves he has it in him, given inspiring content to work with. Ram Sampath’s impressive evolutionary music (Hindi Soundtrack of the Year, so far) - the very skin of the movie, is effectively used as part of the background score snatches, rather than the common-place whole end-to-end spool, as we see in mainstream Hindi films. Amitabh Bhattacharya’s lyrics deserve more than a mention. The wicked genius of DK Bose, which no censor board could touch, and how a lady’s footwear (Sandal, sandal, sandal…) makes comic verse. The original Hinglish version is where the cosmopolitan Delhi city characters fit in to place. Having said that, yet to watch the 100% Hindi version. Yes, the film is tagged ADULTS ONLY, a very wise tag. It also means you need parents with a sense of humour from outer space to tag them along to this one. Do so at your own peril. The same goes for sensitive females too, it is a very male-world movie, no kidding, no chauvinism here. A burqa clad man picks up a glass of water from a tray and pours the contents to the drawn veil, and places the emptied glass on the table, even as a policeman seated beside him glances, bewildered.